This is a fragrant species from Central America. 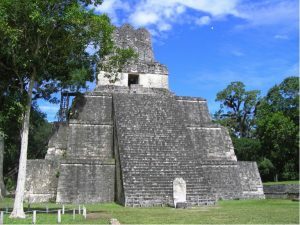 We have seen it growing abundantly in hot lowland forests in Guatemala and Belize and the best place we have found to find it in the wild is to visit the Ancient Mayan city of Tikal where it is east to spot from the tops of the excavated Mayan Pyramids. The photograph here shows one of the large plants (in bud) near this pyramid which makes the climb up the wooden steps well worth it. 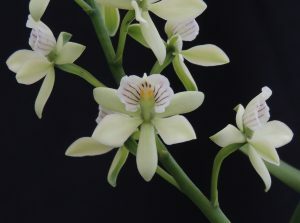 The orchids in this forest are dominated by large specimens which indicates that the dryish conditions do not suit the establishment of seedlings except on particularly wet years. Our plant is grew even bigger than the Tikal specimen and this year we split it into about fifty plants. We grow them in Warm Americas where they are watered most days as baskets dry out quickly. It is interesting that for it to flourish in cultivation we grow this plant much wetter than it grows in its natural habitat. 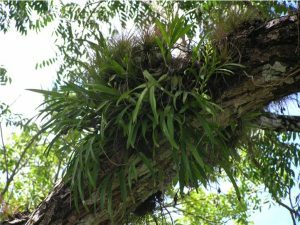 A key reason for this is very extensive root system epiphytes can develop in habitat where roots can run for several metres from a specimen plant. In cultivation deteriorating compost tend to reduce the number of years roots survive for and so the fewer roots are able to collect less water in cultivation. I never thought about plants roots until I discovered your orchids. You have told me so many amazing facts about orchid roots I never realised how interesting roots are or how visually attractive they can be. Of coarse this orchid has very beautiful flowers too!